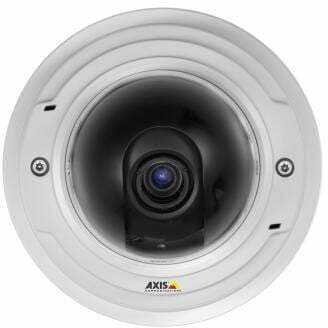 The Axis P3346 is a 3-megapixel day and night fixed dome network camera that offers superb video performance. It delivers full frame rate HDTV 1080p (1920x1080) in compliance with the SMPTE 274M standard in resolution, color representation, 16: 9 aspect ratio and frame rate. Multiple H.264 streams, as well as Motion JPEG streams, can be provided simultaneously. The camera also supports digital pan/tilt/zoom and multi-view streaming, where the full view and several areas cropped from the full view can be streamed simultaneously. The remote zoom adjusts the angle of view over the network and the remote focus eliminates the need for manual focusing. The Axis 0371-001 is also known as AXC-0371-001	or 0371001	.